If however, after this long probationary period, an individual was found to be in any way unequal to the demands of the Pythagorean Life, they were finally rejected and the Community sent the individual away with twice the wealth he had previously donated. At this time, a monument was raised in his honor as if he were deceased. Pythagoras is credited with being the “Father of Mathematics”. He is also credited as being the “Father of Geometry” as well as the “Father of Music”. 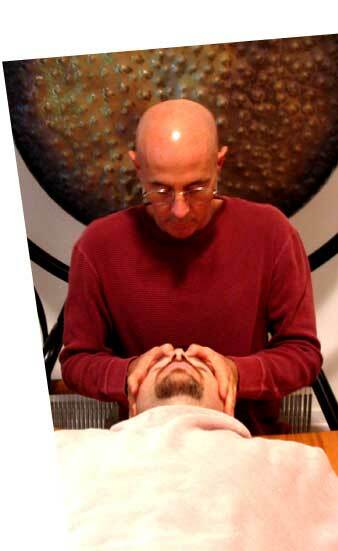 He discovered the musical intervals and taught that you could heal using sound and harmonic frequencies. He was the first person to prescribe music as medicine. He is considered the “Father of Harmonics”. He applied the principles of harmonics to everything from music, art and architecture to running governments, raising a family, friendship, and personal development. He is considered the “Father of Philosophy” in fact he was the first person to introduce the word, “Philosophy”. His Teachings, the “Golden Verses”, and his universal application of the “Golden Means” are a testament to his transcendent genius. Pythagoras, like his contemporary The Buddha, (as E.M. Cornford puts it) was “one of those divine men of whom history knows least because their lives were at once transfigured into legend”. 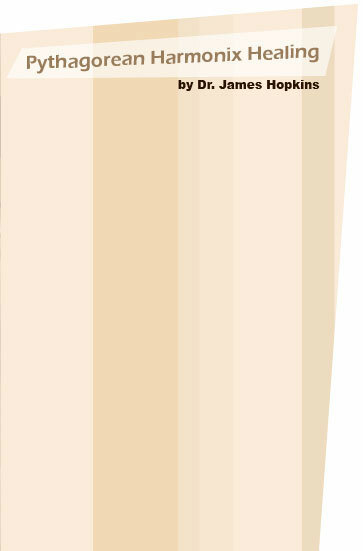 We can rely on a succession of credible scholars to substantiate that Pythagoras was born around 569 BC. (about 2575 years ago) on the island called Samos. He lived for nearly a hundred years. At a remarkably early age he exhibited an unparalleled “attraction to learning”. His father, Mnesarchus (an affluential merchant from Tyrs) insured that he received the best education conceivable. He not only studied with the preeminent scholars of his time; he rapidly surpassed them. This enlightened luminary matured into one of the greatest living Masters in history. He contributed important developments to the field of astronomy. Pythagoras was the first known Westerner to declare that the Earth was round. He argued that the Earth itself was a sphere and based this assertion upon his keen observations while looking at the curved shapes of the shadows cast upon the moon during an eclipse. Many of his theories were controversial in the West up until the time of Copernicus. (two thousand years later) Pythagoras demonstrated that day & night were the result of the Earth’s revolution. He explained that the moon is “bright” because it reflects light originating from the sun. He understood fully the nature of solar and lunar eclipses. He was the first to divide the Earth into five climactic zones ranging from the cold polar to the warmer equatorial regions. He taught that the change in the seasons was due to the tilt of the Earth’s axis relative to the sun. Pythagoras was the first to point out that the morning and evening stars were in fact the same planet- Venus. The Mystery School he founded immediately drew thousands of Disciples. His criterion for admittance was stringent resulting in a cultivated community of devout geniuses. The curriculum was designed with a single underlying purpose: to bring the lives of men & women into Harmony with the Divine. He studied the legal system in Crete and Sparta where he mastered the foundations of law and government. During the second half of his life, the Senate continuously sought council from Pythagoras. As a result he exerted tremendous political and governmental influential throughout the region. He clarified the difference between logic, analysis, and the power perception vs. the intellect. He abstained entirely from wine and meat and ate modest portions of food that was easy to digest. He saw the body as a temporary vehicle that if cared for properly (through diet, fasting, exercise & contemplation) could facilitate Transcendence by enabling the individual to realize their Divine Nature. Pythagoras was the first Greek be Initiated into the mysteries of the Egyptian Temples. (a task that took 23 years) He was the first “outsider” to develop fluency in the Egyptian language and written characters, to fully master all sciences from mathematics to medicine, from astronomy to architecture. At the same time, he was the only “outsider” to be admitted into the Secret Mystery Rituals including the Stages in Evolution of the Soul. He settled into solitary hermitage on the slopes of Mt Carmel. Secluded in caves, near quite groves & clear springs he remained undisturbed in astute meditation. For centuries this area was known for sacred sites of oracle, mystical worship, and the prophesies of Elijah and Elisha. After 23 years of assimilating Egyptian scholarship, the King of Persia invaded and conquered Egypt. They executed the Pharaoh, captured Pythagoras and took him as prisoner to Babylon. However the Magi (the stewards of Persian science & religion at that time) were quick to recognize Pythagoras as an enlightened individual. Not to mention his prodigious ability to learn and his receptivity to exchange new and valuable ideas. He was allowed to absorb firsthand the wisdom of the Chaldeans. (the renowned astronomers and astrologers) He acquired knowledge from the Magians. (Academicians of Persia) He was introduced to the most prominent sages, savants and scholars throughout Syria… continuing to absorb, assimilate and synthesize. One of his MOST IMPORTANT DISCOVERIES was that harmonic musical intervals could be expressed by perfect numerical ratios, a finding that led him to the realization that all sensible phenomena follow the pattern of number. According to Iamblichus, “Pythagoras said the first important lesson to learn, is that which subsists through music…” for it “possesses remedies of human manners & passions that is able to restore pristine harmony and faculties of the soul”. “Pythagoras devised (musical) medicines calculated to repress and cure diseases of both bodies and souls. The more immediate, evident, and undeniable evidence of the influence of Number on our (mental, psychic, emotional) state is through the medium of music. For Pythagoreans the truth manifests itself through the world of physical phenomena; for example, he had no doubt that through experimentation on THE MONOCHORD one could experience THE DIVINE PRINCIPLES of HARMONY which underlie the structures of the cosmos. Pythagoreans actually used certain forms of music to pacify and harmonize the mind as well as harmonize the irrational passions. For Plato (a Pythagorean) mathematical studies were a preparation for the contemplation of divine principles. For Pythagoreans, mathematical studies ARE the contemplation of divine principles. First Pythagoras asked about their relations with parents and family. He observed the tone in their speech and laughter. He inquired about their friendships and desires, activities during leisure, the nature of events that caused them joy or sadness. He observed their posture, gestures and movements. (regarding them as visible indications about the qualities of their soul) After this careful screening, if Pythagoras deemed an individual acceptable, they were able to join the community but only as an “Auditory” for a period of 3 years. This meant they could only listen to his discourses but they could not see him or engage in the dialogue. Finally after five years of silence, those who had won Pythagoras’ approval were Initiated as Disciples. The Initiates were divided into levels. Those at the highest level were called “Mathematicians”. These individuals were finally permitted to SEE Pythagoras during lectures for the “Inner Teachings”. Pythagoras lectured every evening. Rarely were there less than 600 attendees during nightly lectures. Pythagoras is perhaps best known to modern students of mathematics for his work in geometry, which he mastered during his 23 year stay as an Initiate in the Egyptian Temples. Every spring after the floods along the Nile River Valley, property lines would be obliterated. The Egyptians were forced to re-measure the land that they had cultivated for harvesting. They were compelled toward perfect geometry. 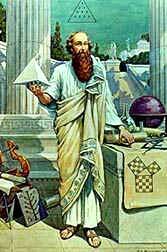 (Indeed the word geometry means “earth measure”) Pythagoras made important contributions to this discipline. More profoundly, Pythagoras transformed geometry into a philosophical discipline which he called “historia” (or inquiry) “Figures as archetypes not figures for profit” was one of his favorite sayings. By this he meant that the purpose of studying geometry should be to turn the soul in the direction of higher aspects, not just to deal with sensory objects or material gain. He was able for example to bring to perfection the theory of proportion, which became fundamental not only to the evolution of Western architecture and design but also to ethics and philosophy. Contemplation of the tetraktys was used by the Pythagorean Brotherhood to merge with the Divine.